I conclude my trek through the short films of Pixar animation by taking a look at one of the very first movies the company ever made. 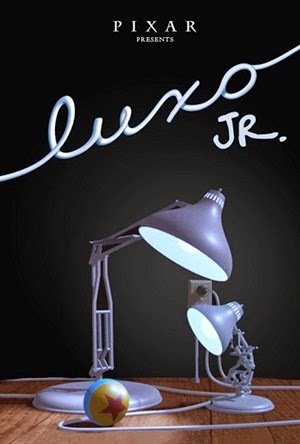 Released in 1986, Luxo Jr. was designed to show industry professionals at that year’s SIGGRAPH conference (which is short for Special Interest Group on Graphics and Interactive Techniques) what could be accomplished with some computer software and a little imagination. The resulting film would forever change the face of animation. The story is quite basic. A desk lamp, sitting contently by itself, is surprised to see a small inflatable ball rolling its way. After the lamp nudges it back in the direction it came from, the ball once again appears, at which point a smaller lamp hops into view, presumably the son of the larger lamp. A little horseplay ensues, and the smaller lamp (named Luxo Jr.) jumps on top of the ball, which, as a result, deflates instantly. The larger lamp (likely its father, Luxo Sr) chastises the smaller lamp for destroying the ball, causing the smaller lamp to sheepishly hop away. A few seconds later, an even bigger ball rolls into view, and the exasperated larger lamp shakes its head (er.. shade) in disbelief. That’s Luxo Jr. in a nutshell. Like I said, there isn’t much to the story. Even the background is basic (black), and never once does the virtual “camera” move or cut away from its initial set-up (at all times, our attention is focused on the larger lamp). You really can’t get much simpler than that, can you? Of course, what the film does do is give its two central characters their own distinct personalities, and then, without words, has them interact with one another. Again, nothing new; Disney had been doing this sort of thing for years. Only now, it was a computer program that brought these characters to life, and not an animator’s pencil. This tidbit of trivia may not seem all that special today, seeing as most modern animated features are at least partially produced inside a computer. But it so impressed the crowd at the SIGGRAPH conference that they gave this humble little film a standing ovation. What’s more, the lamp has since become a key component of Pixar’s corporate logo (replacing the “I” in Pixar), and was the first computer-generated movie ever nominated for an Academy Award for Best Animated Short (a few years later, Pixar’s Tin Toy would become the first CGI short to win that award). In fact, Luxo Jr. has even been deemed culturally significant by the Library of Congress, and is now preserved forever in the National Film Registry. Not bad for a 2-minute flick about a couple of lamps, huh?